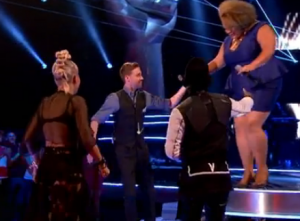 Whilst watching BBC One’s The Voice last night, I got quite annoyed with Rita Ora & how she was wearing her bra incorrectly. I know, I should have been relaxing and enjoying the show. But, surely, Rita should be one of our Bra Ambassadors in the UK, with that fabulous figure she’s got to show off, under that lovely sheer top she wore? You can see from this image, Rita’s shoulders are rounded forward. This will affect her posture, and may cause neck and back ache, over time, if not addressed. The bra band is also “riding high”, indicating the band is too big for her small frame. A way of addressing this is to release the shoulder straps, and pull the bra band down to the smallest part of her back. It’s likely the band will need to be tightened to its tightest setting. It may become even more obvious at this stage that the bra band is too big for her. I was itching to get into my TV and adjust the bra correctly for her! It would have made such a difference to her shape and posture. But that’s impossible isn’t it?